Recently I've been noticing a lot of street level businesses closing shop, either relocating or going under completely in these dismal financial times. 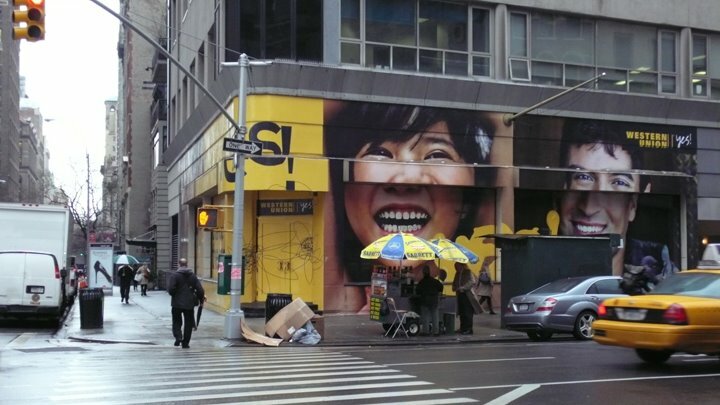 As if empty store fronts weren't bad enough, these empty spaces are now being turned into giant inescapable street level billboards as a way to offset rental losses for the landlord. The complete vinyl wraps are sure attention grabbers and must work very well as ads cause they are popping up everywhere. I had been meaning to look into the legality of these ads when I stumbled upon this one at 22nd street and Broadway on the south east corner. 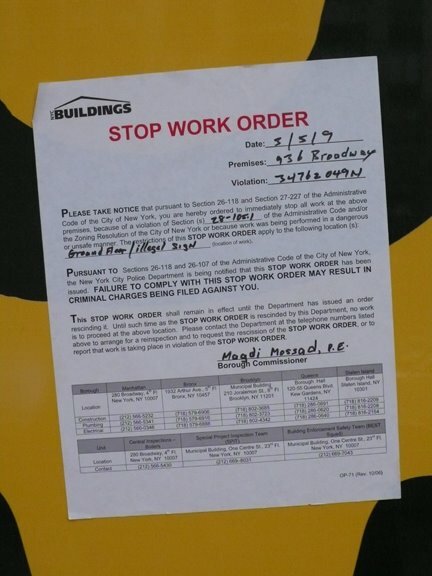 It seems a stop work order has been issued because the sign at this location was erected without a permit. The DOB website has many violations in regard to this sign but complaint #1250447 seems to be the clearest citation. The problem here is despite the sign being erected without a permit and therefor being illegal, the sign will continue to operate exactly as it was intended. It is likely if a permit is obtained, the company responsible for this abomination will face no penalties and be allowed to continue to operate at this location. It is important that we understand that outdoor advertising is able to operate unphased despite the city's best efforts to control rampant illegal operations. If this sign was erected without a permit you can be damn sure the rest of the signs erected in a similar fashion and on similar locations are probably done without permits as well. This is often the case with new forms of advertising, companies test the public's reaction by erecting signage before asking for permission. Only once the public has put out a distress signal do the ads come under city jurisdiction and begin to comply with the law. It is in our best interest to be outraged by these new intrusions and make that voice heard. Maybe enough distaste for this type of signage will keep these from becoming another expected intrusion on our public psyche. If you see any other signs similar to this one please take a picture and send it to us. We will report the sign and follow its removal.